Extruded and injection-molded from post-consumer recycled polyolefins. Dutch company KWS Infra has signed a cooperation agreement with processor Wavin and resin supplier Total to develop roads manufactured from plastics as a sustainable alternative to traditional asphalt roads. The intent is to utilize post-consumer recycled polyolefins (polyethylene and polypropylene) mainly sourced from packaging and industrial applications. Processing techniques will include, but not be limited to, injection molding and extrusion. The concept brings numerous benefits compared with conventional roads. Service life is typically extended by a factor of two to three, for example. 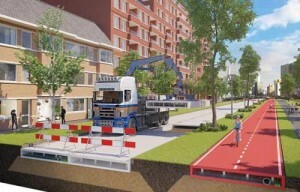 Construction time, meanwhile, is reduced by 70%, and the structure is four times lighter than a traditional road structure.First introduced in 2015 by KWS, the PlasticRoad concept entails recycling plastic waste into lightweight modules with hollow interiors that can be fitted with cables and plastic pipes and allow excess water to drain. The pre-fabricated units will be easy to transport, assemble and maintain, and the lighter weight means the ground will be less prone to subsidence. The overarching objective is to create a road with a smaller ecological footprint than traditional road systems. When the elements reach their end of life expectancy they can be recycled again, contributing to a circular economy and cleaner environment.